STORY: We follow the tale of the Grange family- Mandy, William, Jenny and their mother Eleanor- following the recent death of the children's father. Next they're forced to leave home and move into Howard House, where the children learn of the secret heritage and face a power-hungry enemy. This really reminded me of the old Enid Blyton stories of magic, secrets and adventure, and the plot is solid. The conflict is very strong, too, although the villains were a little too black and white. Nonetheless this works very well for the tone of the story. There were some scenes when we're introduced to the magic where I felt the children accepted it a little too readily, but overall it was well done. CHARACTERS: Each of the children have their own distinct traits. Mandy is the eldest of her sibligs, usually taking on the most responsibility, and becomes the leader of the trio. William is great fun, a good foil for his sisters and able to provide the lighter element, while Jenny, the youngest, retains the caring and compassionate side. The Dees are pretty unique, giving me a vibe of the servants from Beauty and the Beast, and the supporting cast are well developed too. The villains, as I've said, are a little too much pantomime villain for my liking, but it doesn't detract from this style of story. SETTING/ VOICE: The House is very well described- perhaps a bit too much in places- as are the 'other realms'. I particularly liked Glass's realm. The writing is clear with good flow, and returns to the trend of an omniscient point of view, which has been sorely missed in much recent novels. There were times however when the author uses words perhaps a bit too complex for the tone of characters, but generally the children behave as one would expect for their age. PRESENTATION: The cover isn't bad- not the greatest, admittedly- but the formatting is clear and the font easy to read. I only noticed one typo through my reading. OVERALL: This is a really enjoyable read for those who remember reading Enid Blyton as children, and for those who aren't familiar with these types of stories. It's got a truly British style, which I adore, and I'll be glad to continue the series! 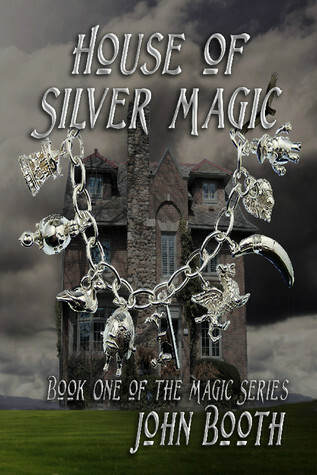 Sign into Goodreads to see if any of your friends have read House of Silver Magic. 0.0% "Getting a very Enid Blyton vibe from this..."